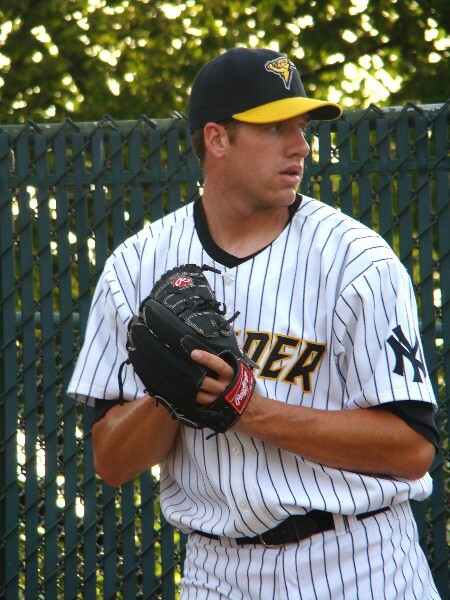 Before 2009: McAllister was selected in the 3rd round of the 2006 draft by the New York Yankees. He was assigned to the Gulf Coast League after signing, and was good out of the gate, posting a 5-2 record and 3.09 ERA in 11 appearances. Despite his lofty draft status, McAllister was brought along slowly due to his age, and he spent all of 2007 as a 19-year-old in Short Season-A Staten Island. The big righty would struggle for the first and only time in his career, posting a 4-6 record and 5.17 ERA in 71.1 innings of work. He still managed the third most strikeouts (75) in the New York-Penn League that season, however, and earned an opportunity to start 2008 in Low-A Charleston. Ultimately, McAllister would split his 2008 campaign between Charleston and High-A Tampa, and he was good in both places. He lasted just a month and a half with the Riverdogs, posting a 6-3 record and 2.45 ERA in ten starts before being summoned to Tampa. He was somehow even better in High-A, posting a sub-two ERA (1.83) and 8-6 record in 15 appearances, 14 of them coming as starts. And in his lone relief appearance, he earned what remains his only career save. 2009: McAllister, for all intents and purposes, spent all of 2009 in Mercer County. And, for all intents and purposes, his last start in Waterfront Park in 2009 will be his last start in Waterfront Park, period. He was as hot as any pitcher in the Eastern League during the first half of the season, earning an All-Star Game start in front of a raucous home crowd. But after that, McAllister was shut down for four weeks with what was described as a sore arm, and only two of his six starts after that lasted five innings or longer. But his last start of the season, in Portland, tied for the longest start of his 2009 season (7.2 IP) and was one of his best as well. He also earned a postseason call-up to Triple-A Scranton and pitched for them in the opening round of the International League playoffs as well. After 2009: I’ll be very curious to see what Zach McAllister’s 2010 season holds. It seems like a lock that he’ll start the season in Triple-A Scranton, and it seems somewhat safe to assume that he’ll spend the majority of his season there, if not all of it. Of course, a September call-up is not out of the question. McAllister was interesting to cover. He was always a quiet kid, and never really had too much to say to anyone. Towards the end of the season, when his sore arm issue popped up, my coverage of that led to a few issues, and we didn’t particularly get along too well afterwards. Don’t anyone misinterpret though…I enjoyed getting to see a talent like him pitch every five days, and thought he was a good guy. Just, as quiet as he was, it didn’t always make for fruitful post-game chats. On the field, opinions are somewhat mixed on what he can become. I don’t think anyone foresees him as a top of the rotation starter in the big leagues…but to say he could be a two on some teams, in my opinion, isn’t a stretch. I think he profiles as a three right now, but that’s only because he doesn’t really have one standout pitch. He’s not very exciting to watch, as he’s more of a groundball pitcher, but he’ll still rack up the K’s on occasion. But he is effective, and he’s proven that he’s been ready for the challenge of every level he’s been at. At this point, there seems very little doubt that McAllister is destined for a career in the big leagues…but when that happens, and perhaps more importantly, where that happens, remains to be seen. This entry was posted on February 12, 2010 at 12:19 am and is filed under Uncategorized. You can follow any responses to this entry through the RSS 2.0 feed. You can leave a response, or trackback from your own site. Baseball America is reporting this evening, in its latest list of minor league transactions, that Paul Bush, Marcus Vechionacci, and Edwar Gonzalez have again signed contracts with the Yankee organization.